Got the license plates and iPhone dock installed today in FJ. Tomorrow run power to the back for radios. Made pancakes and bacon for the family. Now a shower and then trip to daddy toy store(Frys) with Isaac, so mommy can do a workout. @rosiesgrosso cookies GREAT! Mints chocolate chips not so good. Just did something in 5mins that last nite at 12am I spent an hour trying todo and couldn’t. I’m thinking I need a liitle more sleep. Updated blog, had a busy weekend of ‘upgrading’ FJ Cruiser. Tnxs family for letting me recharge! I’ve had the new truck now for a couple weeks and I am still very happy with the purchase. Last weekend I started the process of building a plan for installing all my extra toys, which I knew was going to be a long process. (Multiple ham radio’s, GPS, iPod integration, antennas, power distribution, etc.) I got the idea I would start with Google, I figured someone might have done this before and documented it. Wow is all I can say. There is a huge community which has done EXACTLY this stuff before. I found a online forum dedicated to FJ Cruisers, with a huge group of people basically just like me. I have found multiple articles, all with great pictures, for installing every one of the things I want to install. This even includes the ham radios! I spent something like three hours last weekend just scanning article after article, taking notes and then trying to figure out which solution would be best for me. Yep, I’m really liking this. During this whole process, something occurred to me that I hadn’t really considered before now. Just like there are certain routers you can buy, which are good for hacking on (WRT54G being the best example), there appears to be cars that are good for hacking on to. Unlike most modern vehicles I’ve owned, everything part of the FJ cruiser is accessible after removing a few screws and pulling some clips. The entire fuse panel is readily accessible and it has extra drops of power. Without knowing it, I have bought the WRT54G of vehicles! I can only assume that Toyota knew that the vehicle was going to appeal to a certain type of person and decided to build the product for them. The first step was ordering the supplies I would need, they slowly started showing up during the week. 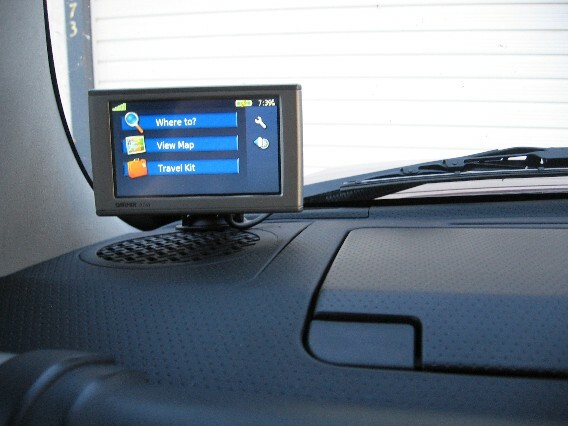 (I actually managed to find about 90% of them at Amazon.com) I decided to attack the most basic items first, integrating the iPod and getting the GPS installed. I ordered this magic box which plugs into the back of the stock stereo and makes the iPod look like an external CD changer to the stereo. It took me all of about 25 minutes on Saturday to get the radio pulled out, install the cable into the back and route everything. The hardest part was actually figuring out where to mount the magic box under the dash, since there were so many options. Which brings me to another cool thing. My GPS informed me today that its maps were two years old and I should update them. So I said cool, brought it inside and attached it to my Mac. (via USB cable) I’m really not sure how, but after pointing my browser to the Garmin site, it was able to access the GPS via USB (running something inside the browser) and figure out what update it needed. In order to-do the update, I had to install a browser plug-in, so it must be running some java applet, but it managed to figure out the model and state of software without having anything special installed. I was really impressed. I’m now sucking down 2.35GB of maps for the US and Canada. I’m going down to Tacoma next week for a D-Star radio thing, so I probably won’t get much done. I’m still working out the ‘where’ part for installing the radio’s. I’ll probably route a separate power drop, right off the battery, to the back of cargo area. That alone is probably a ‘weekend’ worth of effort. (I’ll install a separate fuse panel for it and do relays so it gets turned off and on with the ignition.) I’m thinking of building a ‘radio box’ using MDF, but it is still a fuzzy idea at this point. @wa7nwp he is the man! Dr Joe is super cool guy, total shock when you realize he won a Nobel Prize. Was up until 3am ‘leading’ a massive system up grade. We were ‘following the moon’ todo it during low traffic. 1 more to go in 30mins.